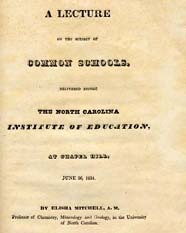 Elisha Mitchell, 1793-1857 A Lecture on the Subject of Common Schools, Delivered Before the North Carolina Institute of Education, at Chapel Hill, June 26, 1834. A Lecture on the Subject of Common Schools, Delivered Before the North Carolina Institute of Education, at Chapel Hill, June 26, 1834. Chapel Hill [N.C.]: Printed by Isaac C. Patridge, 1834. Public schools -- North Carolina.